Does this leak reveal the Lenovo Yoga 900's final specs? Lenovo might be ready to give its Yoga convertibles a shot of Intel Skylake energy. 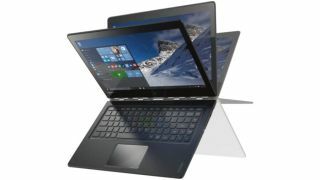 First reported by WinFuture, the Lenovo Yoga 900 will be the follow up to last year's popular Yoga 3 Pro and it will bring with it a spec list that will have many owners heading to eBay to get rid of their old model. If the leaks are correct, the Yoga 900 packs either the Intel Core i5-6200U or Core i7-6500U chip with Intel HD Graphics. It will feature up to 16GB of RAM and space for up to 512GB of SSD space. On the display side of things it has a 13-inch Quad HD+ (3,200 x 1,800 pixels) IPS display and it comes with a 66Whr battery that is up from the 44.8Whr cell provided in older models. Looking towards the future, Lenovo has reportedly supplied the new model with a USB Type-C port, however, it cannot be used to charge the laptop, as there is a separate DC input for that. However, it can be used to connect monitors by using a special VGA or HDMI adapter. Other features will include two USB 3.0 ports, 802.11ac Wi-Fi, 1.5W stereo speakers, an SDXC card reader, webcam and HDMI out. It weighs in at around 2.8 pounds and is expected to be priced starting at €1,299 ($1,450) when it gets its release in October, according to the report. We have contacted Lenovo about the report. We will update this story when we hear back.